‘The Biennale has always made its visitors marvel. That sensation has to remain,’ insists Jacques Grange, the celebrated interior designer shaping this year’s Biennale des Antiquaires in Paris (11–21 September). His ambitious vision is to reinterpret André Le Nôtre’s formal gardens at Versailles under the magnificent glass roof of the Grand Palais – with the help of the gardeners of the Château de Versailles et de Trianon, and great swathes of trellises and topiary. Other delights include an ‘olfactory’ fountain at the entrance – scented with Marie Antoinette’s Bouquet de la Reine as recreated by Maison Francis Kurkdjian – intended to plunge the visitor into the heart of the 18th century, and set them off down one of three paths to discover the works of art on display. It is a laudatory aim for traditionally the grandest and most spectacular of all art and antique fairs, and one that regards its role as celebrating all that is great in French culture. Sadly, however, all in the garden is not rosy. Just two months before the fair’s opening there was a palace revolution. The board members of the Syndicat National des Antiquaires (SNA), the organisation representing the French art trade, voted to dismiss its president, Christian Deydier. His detractors accused him of – among other things – autocratic behaviour, and raised concerns over the millions he spent on both constructing the fair and promoting it overseas. The SNA’s timing may be seen as yet another instance of the ever-warring and factional French art trade shooting itself in the foot. For the final weeks running up to the fair, the now New York-based Hervé Aaron – the former president Deydier ousted in 2010 – was approached to take over the fair’s organising committee. Plus ça change. Of all the great fairs, the Biennale des Antiquaires has struggled most to adapt to the realities of the new art world. It has always been about bella figura (expensive for exhibitors) and the most opulent and luxurious of furniture and works of art. These days, when informality, minimalism and modern and contemporary art prevail, the market for the French 18th century in particular remains robust only at the highest levels. Moreover, the difficulties of the home market have only been exacerbated by the punitive new tax regime imposed by President Hollande’s government. Recent editions of the Biennale have been riven by crises of confidence, boycotts and often ill-judged directives to introduce more contemporary material. That said, the 2012 fair seemed to have begun to regain its bearings. The large centrally placed galleries offered impressive displays of great works from major international as well as French dealers. This albeit rather limited internationalism is part of the problem for some of the smaller SNA members who have been forced out of the fair. New-York based exhibitor Dominique Lévy is one who applauded Deydier’s battle to fight for more foreign representation and bring in much-needed collectors from around the world. ‘He had a vision for the fair, and an ambition for it. I fear that the current pettiness will result in a return to a more parochial approach which will be detrimental to the quality of future editions,’ she laments. One area where the fair has gone from strength to strength is haute joaillerie, where the big global brands, many of them French, launch new collections and present a high proportion of unique and handmade pieces, marketed – not unreasonably – as works of art. This September sees the highest number of jewellery exhibitors in the fair’s 52-year-history, a triumph perhaps but also part of the dilemma concerning the nature of this event. The 2012 Biennale came uncomfortably close to looking like a glamorous jewellery show with some art and antiques tacked on. Certainly art and antiques dealers looked on in dismay as the jewellers’ high-spending clients, not least from China and Brazil, were escorted from the fair’s entrance to individual jeweller’s stands and then back again. What should stop those clients in their tracks? There are also jewels and semi-precious hardstones from antiquity. Phoenix Ancient Art, for instance, obliges not only with an exceptionally large gold fibula or cloak fastening inset with a finely carved agate cameo, but also with a Roman intaglio, also of around 200 AD, carved in precious rock crystal. 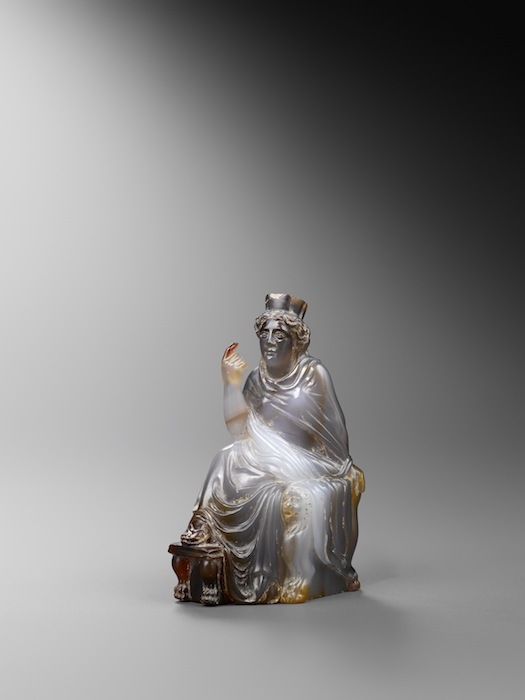 Even rarer is a 12cm-high statuette of the seated goddess Cybele or Tyche, carved – no mean feat – out of chalcedony. The 1st-century craftsman has used his material ingeniously, exploiting the different bands of colour in the stone to accentuate particular details. 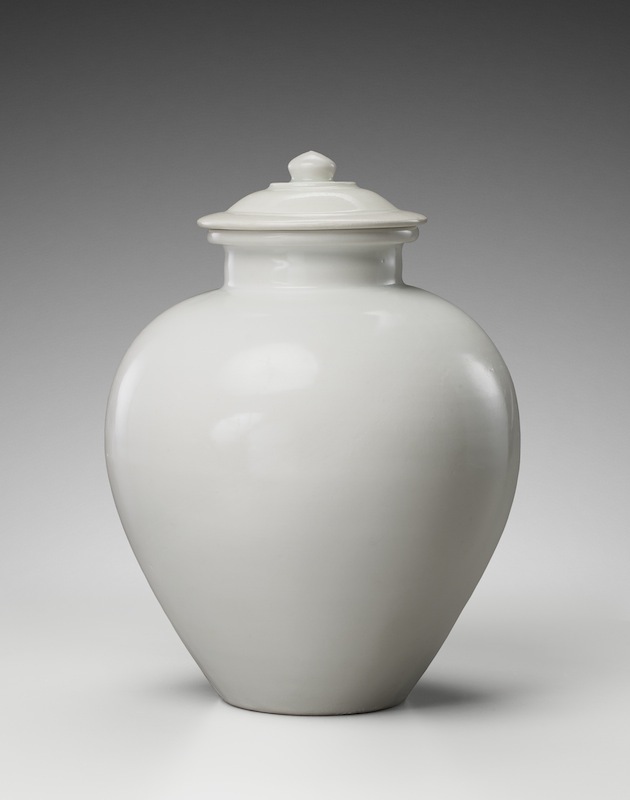 What may well astound visitors is the perfectly potted – and perfectly plain – glazed white jar from the Tang dynasty offered by Gisèle Croës. Dating to the 9th century, it is a rare surviving example of the famed Xing wares from Hebei, praised by poets for their luminous beauty – the 8th-century tea master Lu Yu described them as ‘white as snow and bright as silver’. This example bears the Ying mark revealing that it was made for the imperial Daming Palace. There is also a jewel-like quality about the small, intimate portraits of Corneille de Lyon. Richard Green offers a characteristic portrait of a young man, painted against an olive green ground around 1545–50, and which is firmly given to the master rather than his extensive workshop. These refined portraits seem to have been painted directly on to wood panels in a few sittings without any preparatory underdrawing, and combine broad, impressionistic brushstrokes with minutely rendered detail. As for the French furniture dealers, they are hopeful that the recent reopening of the dazzlingly refurbished French decorative arts galleries in the Musée du Louvre will serve to revitalise the market. The grand Galerie Kraemer, for one, is reminding visitors that it is still possible to acquire museum-quality works of art. Its stand is devoted to ‘twins’: that is, works of art that have their double in one of the world’s great institutional collections. For sheer sculptural bravura, I single out the pair of serpentine rococo gilt-bronze chenets or firedogs, decorated with figures of tritons with flowing beards and tresses and curling fishtails, blowing on their conch horns to calm or raise the waves. The tritons’ doppelgänger are in the Louvre itself, signed by Antoine Moreau. 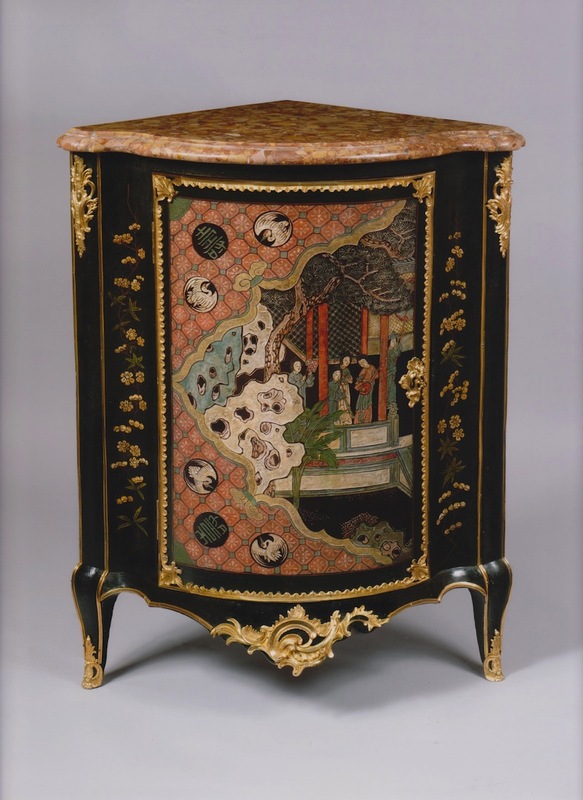 Galerie François Léage presents a pair of Louis XV lacquer corner cabinets combining Chinese coromandel lacquer with vernis Martin panels. Dated 1745–49, they are stamped with the mark of Adrien Delorme. Not everything at the Biennale, of course, is French. Galerie G. Sarti, for one, presents a delectable commode of around 1730–40 by the peerless Turin master Pietro Piffetti (1770–77). Its pair was once in the collection of the Marquess of Bath at Longleat. The Biennale’s broad overview of fine and decorative art continues through the 19th century to modern and contemporary. Dominique Lévy presents new cabinets by the designer Peter Marino as well as post-war art that focuses on the European/American axis, not least Yves Klein’s spectacular fire colour painting Untitled (FC3) of c. 1961–62. The Gradiva and Hopkins stand offers Louise Bourgeois’ great bronze, Spider II. There is plenty to marvel at outside the Grand Palais too. Steinitz, one Biennale stalwart which is also staging a gallery show, devotes its space to the decorative arts of Édouard Lièvre (1828–86). Other notable commercial shows include Eileen Gray at Galerie Jacques De Vos and Strasbourg silver-gilt at Galerie J. Kugel. Overlapping the Biennale is the Parcours de la Céramique et des Arts du Feu and the tribal art extravaganza Parcours des Mondes, both 9–14 September in the galleries of Saint-Germain-des-Prés. Galerie Furstenberg presents ‘Mysterious Works from Pre-Columbian America’, which brings together objects whose meanings remain elusive, such as a terracotta shamanic bowl with a fantastical creature borne on the heads of two figures. It originates in the Jama-Coaque culture of ancient Ecuador, and is dated around 100–600 AD. The Biennale des Antiquaires runs in Paris from 11–21 September 2014.